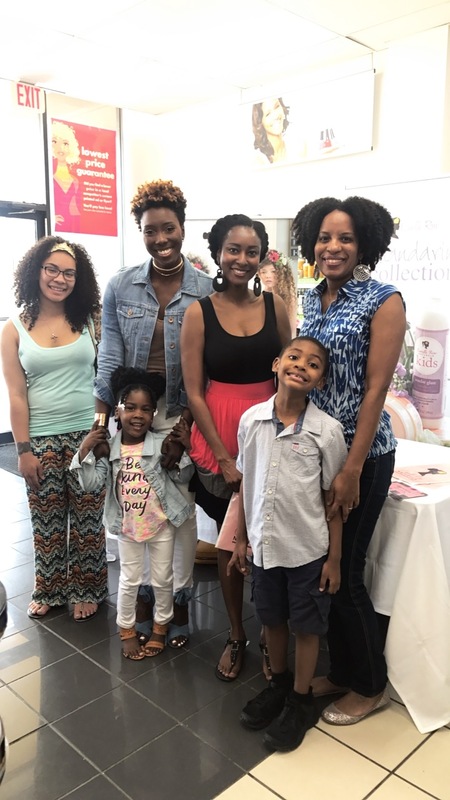 This past weekend I had the absolute pleasure of hosting an in-store event with Camille Rose Naturals. Camille Rose launched a new kids line and I must say, I am IN LOVE with the products!! They work so well on Aria's hair, so I was thrilled when Camille Rose reached out for me to host the Maryland stop of their Mother's Day tour. The event was a success, bringing in mommies and their little princesses to meet Aria and I and try out the new products! I was able to do a live demo, sharing knowledge about the products and also answer questions. I am so blessed and honored to do what I love with my daughter. I am so thankful for all of the ladies that came out to the event! A special shout-out to my girls April, Amanda, and Anaiah for coming out! These ladies ALWAYS come out and show me love at events and I really appreciate them! Also, a shoutout to a new friend I met La-Anna. We connected via Instagram a few months prior to the event. She has been a huge supporter of mine for a while and I was excited to meet her, just as much as she was excited to meet me. I genuinely love connecting and meeting the women who are inspired by me because I, in turn, are inspired by them. It motivates me to keep pushing. Thanks, Camille Rose Naturals for having us as the hostesses of this amazing event!! If you haven't already, definitely check out my previous post to see how we use the Camille Rose products!